James Dillon (pictured) is looking to pound Lincoln-Sudbury back to Gillette Stadium. Boston, Mass. -- James Dillon still remembers the late evening hours of December 2nd, 2017. Walking off the Gillette Stadium field, sitting in the locker room, and meagerly walking to the bus in disbelief Dillon can recreate the shock that encompassed Lincoln-Sudbury in the wake of its 10-7 loss to King Philip in the Div. 2 Super Bowl. At halftime, Lincoln-Sudbury led 7-0 and late in the fourth quarter had a chance to win the game following a missed King Philip field goal. But a strip sack, fumble recovery, and Cole Baker game-winning field goal dashed the dream and left Dillon and his teammates wondering what could have been. Back for his senior season, the Warriors’ All-State running back and linebacker is trying to lead Lincoln-Sudbury back to Gillette Stadium. So far in 2018 Lincoln-Sudbury has showed few signs of a setback. Dillon is piling up the numbers out of the backfield for Lincoln-Sudbury highlighted by a five touchdown performance versus Springfield Central in week one. When not showcasing his athletic build and quickness at running back, the six-feet, 210-pound Dillon stymies opposing his offenses with his ability to tackle and instincts in the passing game at linebacker. Born in Sudbury, Dillon has always been enamored with baseball. In the spring, he serves as Lincoln-Sudbury’s starting third baseman and has been in the middle of the order since his sophomore season. Over the last three years, however, Dillon has also evolved into one of the state’s premiere backs. Alongside premiere offensive lineman Cal Kenney and two-way standout Mike Ciaffoni, this Lincoln-Sudbury unit looks poised to complete the final two quarters this time around. It certainly looks like Dillon and company may be well on their way to making sure their last memory of Gillette is full of celebration. In order for Lincoln-Sudbury to get back to playing December football, however, they likely will have to go through a North Andover team that is loaded for bear in 2018. 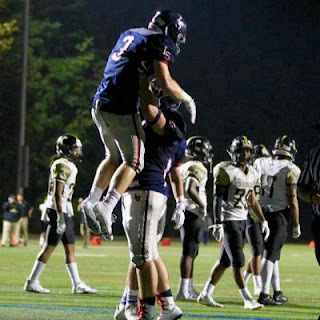 At the center of the attack is quarterback Jake McElroy who has become known as one of the top three-sport athletes that Massachusetts has to offer. When not filling up the stat sheet under the bright Friday night lights, McElroy is either piling up the point totals on the basketball floor or showcasing his range in the hole as the Scarlet Knights' shortstop. Basketball admittedly comes most naturally to him, despite starting his football career back in fifth grade for the boosters club. He attended the Brooks school his freshman year, but despite having what he labeled a ‘good experience’ determined that North Andover High School is where his athletic and academic future would play out. Over the course of his high school career he has worked his way up through the North Andover football program alongside his friends in wide receiver Gabe DeSouza and halfback Darren Watson. Sophomore season presented the chance for him to get his feet wet as his Scarlet Knights teammates welcomed him back with open arms and he learned the ropes of varsity football. Come junior year, McElory took off using his trait as a true dual-threat quarterback to create plays on the run when the pocket breaks down. McElroy also proved that when given the time to stand in, step up and throw he can decimate opponents with his arm and accuracy. For the 2017 season McElroy threw for 1,847 yards and 16 touchdowns. On the ground he was just as much of a threat piling up 500 yards on the ground to go with 11 scores. In the winter, meanwhile, McElory led the basketball team to a Div. 2 North sectional title. Now a senior McElory is using his experience, hours of preparation, and innate love for the game to dismantle opposing defenses. DeSouza and Watson have turned into McElroy’s top two weapons, creating a triple-headed monster that has been impossible to stop in the early going. Through two games McElory is 16-of-21 for 446 passing yards and five touchdowns. With the early part of the slate behind them, and a showdown with Div. 1 power Central Catholic on Friday, McElroy notes that all focus is on a state championship.
. Everett and St. John's Prep are scheduled to face off against each other Saturday afternoon at 1:30 pm. The Crimson Tide are 16-2-2 overall versus the Prep.